A Paper Garden: Earth Day Extravangaza! justjohanna is having an Earth Day Party on Saturday April 19 - and all of you are invited. The design team members (including yours truly) will be hosting Earth Day related challenges for fabulous prizes! All you have to do is create a card for the challenge and leave a comment with a link to your creation. You can enter any or all of the challenges as many times as you like until the cut off at midnight (PDT time) on 4/20. The use of justjohanna stamps is encouraged, but not required. There is a list of design team members on my side bar. If you do not have a blog, you can use the justjohanna form to display your card. I will be posting my challenge at 9:00 am (east coast time) on Saturday the 19th. Its a fun and easy one! I will draw a second name to win a Denim and Lace Papercraft Kit from the Paper Garden Projects Store. So be sure to check back in on Saturday for a chance to win some fun stuff! The justjohanna Earth Day celebration will be such fun! 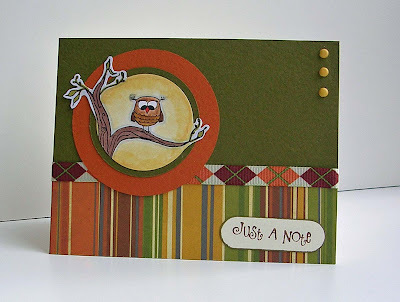 This is fabulous I love what you did around the owl with the moon, branch and circle and the colors/Dp are fabulous!! Sounds fantastic Kathrine! TFS! Love the card...very sweet! Your card is fabulous! That ribbon coordinates perfectly with the paper. I am really looking forward to the party tomorrow! !